We offer a full line of precision motion X/Y stages for all microscope models and custom applications. They are available as traditional coaxial knob controlled motion models, inverted control models, and push movement. All are constructed of ground tooling aluminum plates, stainless steel ball bearing systems, and adjustable raceways to assure years of maintenance free service. 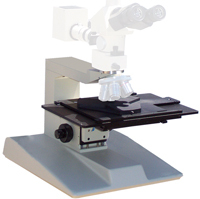 We can provide the microscope models with accurately drilled mounting holes for your specific model for trouble-free installation. We can provide linear encoder systems and DRO’s for measurement applications. If you have a specific stage requirement contact us for many other models not listed as well as custom travel models.